Spring Training Drills, where do you begin? You actually should begin with physical fitness, strength and endurance training, because you can’t perform the entire season at top level if not physically capable. Having said that, we’re going to assume all of your athletes showed up in excellent condition and are ready to go, and for youth teams that should essentially be true. 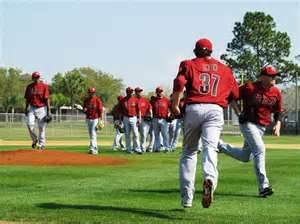 There are certain drills which are standard spring training routine and every player, yes even MLB players, must participate in. Why would a MLB player be forced to do mundane basic skill drills? (3.) The drills are designed to address 95% of the basic skills required to play a position. To date I know of no .1000% hitter, undefeated pitcher or error-less regular fielder, therefore, nobody has completely mastered these skills and there’s always room for improvement. A pitcher’s first instinct on any ball hit to the right side of the infield is to begin running to first base in the event the first baseman can’t cover the base, he will. 1. Assemble your pitchers at the pitching mound, or the correct pitching distance for the players’ age. Place a pitching rubber down, which is the beginning point for all the pitchers as they rotate through the drill. 2. Have your first and second baseman in their normal playing positions. 3. From the plate area, hit ground balls to the right side of the infield which requires the first baseman to leave the base in order to field or attempt to field the ball. 4. The pitcher upon contact will run a direct straight line towards first base. 5. The fielder will throw the ball to the pitcher, which requires timing, always aiming chest high. 6. The pitcher will catch the ball, then step on the edge of the base, on the infield side for the out. 1. Hit ground balls in between the first and second baseman with directions they are to field anything they can reach. 2. The second baseman is to field balls and throw chest high strikes to the pitcher, which must be timed as the pitcher is moving. 3. The pitcher must become familiarized with the different angle the ball approaches from when coming more from second base than first. 4. The first baseman, fielding a ball far to his right, must learn to stop his forward momentum, come set and throw to first. 1. Timing, refining the leading of the pitcher(s) which have different running speeds and different heights. 2. Practicing chest high throws which is the easiest elevation to catch the ball and maintain 95 - 100% control of the body in the event something happens which requires the pitcher to alter his positioning. 3. Teaching the pitcher the line in which to take to the base; catching the ball wherever it’s located; and quickly finding the base in order to touch it properly. *** You never want to step onto the center of the base as risks for injury between the pitcher and runner are too great. 1. The pitcher is to run as hard as normal to cover the base. 2. The coach calls “No cover” or “Pull up” or any other phrase he may pick, indicating the fielder will make the put out instead of the pitcher. Doesn’t matter if the fielder can or can not make the put out, the intent is to have the pitcher pull off. 3. The pitcher upon hearing the command, should veer slightly to his left, moving away from the approaching runner, as he decelerates. 4. The pitcher is never to slam on the brakes to stop as that creates the risk of injury through a twisted ankle, hamstring and other assorted possibilities. 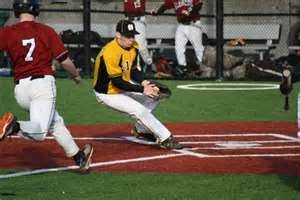 There will be times whether by wild pitch or passed ball, a runner will attempt to score from third with the catcher out of position. 1. Have your pitchers and catchers rotate through this exercise to avoid fatigue. 2. Have your pitcher actually throw a bad pitch, half speed if need be, and have the catcher miss the ball. 3. 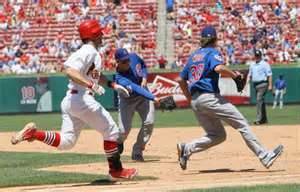 The pitcher should instantly, upon seeing the ball get passed the catcher, run to cover home plate. 4. The pitcher should position himself straddling the front and left corner, as facing the pitcher, of the plate while facing the catcher, who is chasing down the ball. 5. 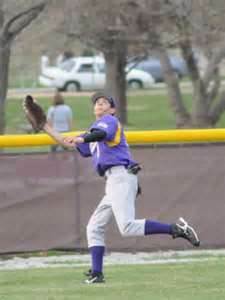 The catcher upon retrieving the ball, is to throw a low throw, aim for the pitcher’s ankles, where the pitcher can catch the ball and apply a quick swipe tag on the sliding runner. 6. This drill also teaches the catcher how to properly track down, field and throw to home plate, but there’s more to it than that which is covered in the Catcher segments. To say being a catcher is simply learning how to catch and throw is like saying an Xbox player can navigate a jet, but this is the period for grunt work and we concentrate on the basics. 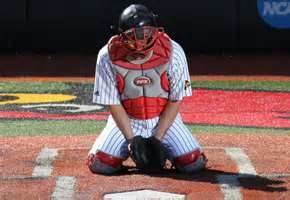 Always have your catcher in full gear while performing any drill, perhaps not to prevent injury, but they’ll be in full equipment in the game. 1. Standing halfway between home plate and the mound, throw balls in the dirt for the catcher to block. a. The catcher should immediately drop to their knees and place the mitt on the ground, in front of their crotch to present a solid wall. b. 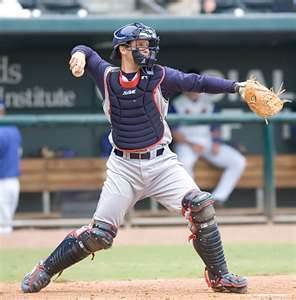 The Catcher should lean slightly forward, when the ball strikes the chest protector, the ball will deaden and bounce directly out in front of the catcher usually within arm’s length. 2. Move halfway down the first base line and throw balls in the dirt aimed for the catcher’s left knee. 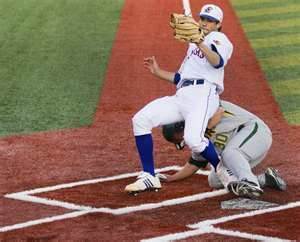 This forces the catcher to leap frog, turning his entire body in order to face the ball. 3. Move halfway between home and third base, throw balls in the dirt aiming at the catcher’s right knee. Same holds true as #2. Teaches mobility and the ability to present a solid blocking wall regardless of the ball’s angle. Have a batter stand in the batter’s box to simulate real game conditions. a. Throw pitches to the catcher and have him practice fielding and throwing to first base behind the runner. This should be done from the knees and from bounce up and throw footwork. b. Have the catcher practice throwing around the hitter to third base. A catcher should always step and throw behind the runner, not in front of him. Have him practice his footwork of stepping around the batter. 1. Hit ground balls, ground balls and more ground balls. There’s a lot more to being a good infielder than fielding ground balls, but you’ll never get the chance to learn anything else if you can’t cleanly field ground balls consistently. 3. Begin double play procedures, but not at full speed, you’re more concerned with the proper mechanics at this point. 1. Much as infielders, hit fly balls, fly balls and more fly balls until you’re sick of looking at a fungo bat. 3. Hit balls over their heads on left and right sides, teaching them to instantly turn the correct way. 4. Hit ground balls, especially into the gaps, forcing them to quickly track the ball down, turn and quickly locate and hit the cut-off man with a throw. The specifics of these drills and instructions explained in detail are in other links, but these drills will set you on a straight course to a productive spring training session.